Free up some space in your home or office with self-storage rentals from All Port Self Storage. We have 60 units available for either long- or short-term rental. For your convenience, our facilities are open 24-hours a day, 7 days a week. To make the moving process easier for you, we also offer cube vehicles and various sized van rentals. When you store your goods with us, you can rest assured that your possessions will always be safe. Our units are located within a fenced facility that requires keypad entry. Our facilities also feature video surveillance and security lights so that you can feel safe whatever time of the day or night it is. Glenn and Kelly Evans have lived in Port Perry all their lives and have been in business since 1981. They purchased an industrial property and began renting 7 of the units to automotive companies. 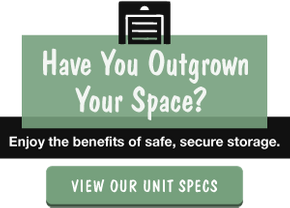 After receiving positive feedback and noticing a strong demand for affordable storage, they expanded the business into what is now known as All Port Self Storage. The well-known husband and wife duo now also have an auto glass business, car rental business and sign shops business on the same property. Want to hear more about our rates? Give us a call for a quote today.